A foreign friend of mine had a query as regards what, exactly, is a "stocking stuffer" as in the sentence "She has got the kids some stocking stuffers for Christmas". Anyone else ever use this expression in American or British English? Or am I really alone here? A stocking stuffer is a small gift that fits inside a stocking (those big sock-like things that are often hung off of fireplace mantles). These can be all sorts of little gifts that aren't necessarily THE gift. stocking stuffer NOUN:A small present, especially one that is placed in a stocking at Christmas. Thanks very much DCPaco! I had wondered whether I was the only one using this expression! Didn't want to lead anyone astray! 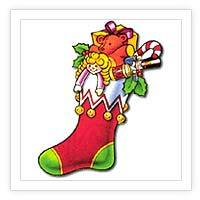 Here's an image of a stocking that happens to be stuffed with little gifts. Now, in the households where there is lot$ of money, the stocking stuffers are small but are sometimes still pricey (rings, watches, keys, money)...also in stocking stuffers go gift cards...just anything that is small. This is, I guess, to prolong the whole gift experience of opening up more little gifts. In BE we would normally say 'stocking filler', which may be why you feel alone in London with the expression 'stocking stuffer'.. Thanks Louisa . . . I was beginning to wonder if it was an AE expression!